Preheat oven to 375°F. Line the bottom of a 9-inch pie plate with 1 pie crust. Set aside. In a large bowl, lightly toss brown sugar, flour, cinnamon, salt and apples to combine. Add cheddar cheese, maple syrup and pecans, if desired, and toss lightly to combine. Place filling in a mound on top of crust in pie plate. Top with second pie crust, folding the edges of the top crust over the bottom crust; seal edges and flute. Use fork tines to poke a few holes in top crust. Cover edges of pie crust with foil. Bake 40 minutes, then remove foil and bake another 20-30 minutes or until pie is golden brown and bubbling. Remove from oven and brush top with more maple syrup. Place on cooling rack to cool completely before serving. Do you ever feel like you’ve had enough of pie? Like, you’ve tried all the pies there are and there’s really no reason to have any more? Thankfully (or perhaps not-so-thankfully) my sweet tooth prevents me from ever accepting that there is no more pie necessary in my life. Though I have to admit that sometimes, plain ol’ apple pie just doesn’t cut it for me. 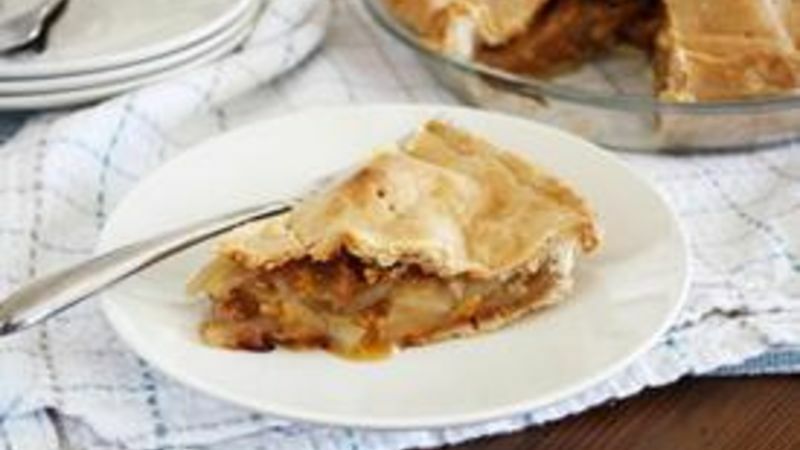 So when I’m in the mood for pie, but not just any old pie, I make a few changes – and that is how this Maple, Apple and Cheddar Pie came to be. I have a serious crush on maple syrup and sharp cheddar cheese. And since I also have a crush on the combination of cheddar cheese and apples, and apples in pie, and also maple syrup and crunchy pecans, my crazy pie-loving mind was inspired to try this mash-up and I am SO GLAD it did (This is how my brain works. It’s a chaotic business up in there.). Once you try it, you too will understand that maple syrup, cheese and apples are a trifecta of magical mouth tastiness. It’s a thing. Firstly, you’ll roll out one pie crust into a pie plate, slice up some tart apples and get all your purdy little ingredients all in a row. Then, combine the sugar, spices, apples, CHEESE, syrup and pecans. Commence the uncontrollable salivating. Pile all the good stuff up in the pie plate, then cover it with another pie crust. Bake the pie until it’s golden brown and bubbly and your kitchen smells like heaven and a choir of angels begins to sing in the background, then brush the top of the pie with even more maple syrup. OH YES. Try with all your might to let the pie cool completely, then slice, stuff and revel in the wonder that is maple syrup, apples and cheese.